I know I promised this blog wouldn’t become a kids blog– but this is my life currently (along with spit up and sleepless nights). I am working on my daughter’s second birthday coming up in March, so hopefully there will be some party updates coming soon. 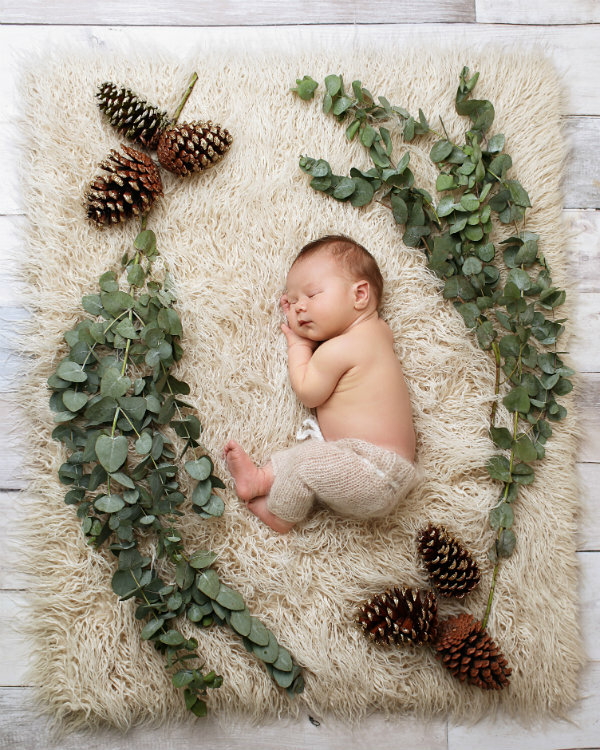 Anyhoo, if you follow my on instagram you know that our baby boy was born in November. He’s a sweet little boy, our Rush Elias. As they say, we weren’t quite as organized with the second baby. For our daughter, her nursery was ready a month early. 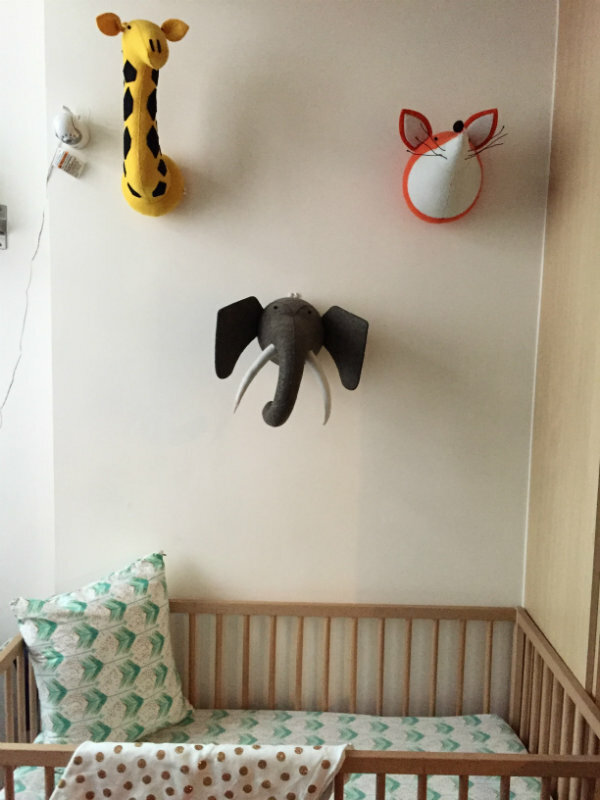 Rush’s nursery has just come together, 2.5 months after he was born. When we found out we were having a boy, I figured the new baby would take over East’s room, so I brainstormed on how to use her arrow linens. In the middle of the night (when all the best ideas come) I decided on Woodland Animals. Turns out woodlands animals are out and safari animals are what’s trendy right now, so I had to be a bit flexible with my animal choices. It still turned out cute, I think! Don’t these animals look like these popular (and expensive) heads? I looked all over for something that wouldn’t cost tons for shipping to HK and was able to find these on TaoBao (the Mainland China Amazon/Ebay). The site is only in Chinese, so my husband’s work colleague had to assist us– in return she saw them before I did! But we were able to save hundreds of dollars (and who knows– they could be the Chinese supplier of the fancy brand!). 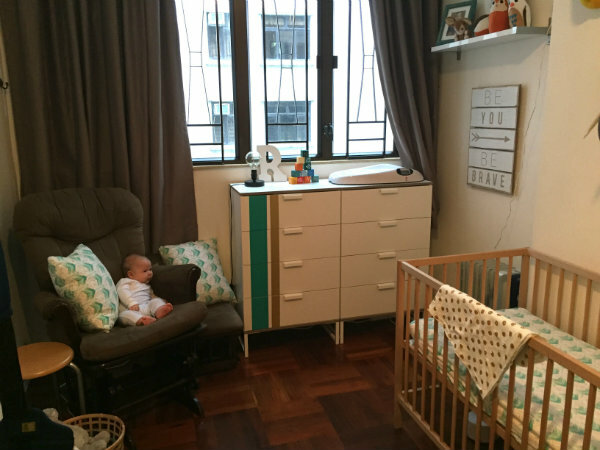 Hong Kong isn’t always the most stroller friendly place, so we have tried nearly every baby carrier. We have quite the collection and I need somewhere to keep them organized and accessible. 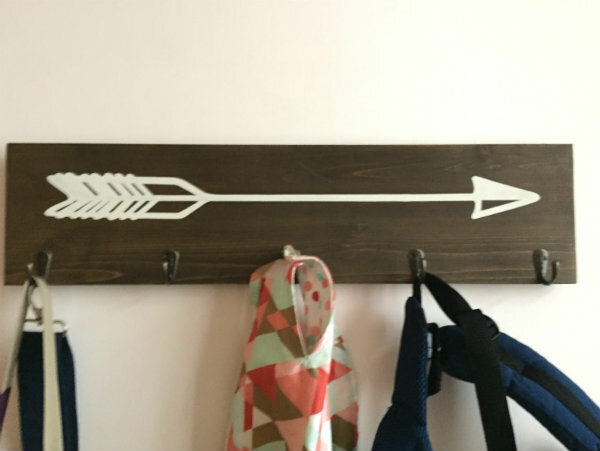 I loved this arrow hook panel from Target. Aren’t those little animals cute? I did get some woodland creatures in, with this cute bowling set from Etsy. That sweet picture of my hubby as a chubby little babe, with his favorite bunny kills me every time. 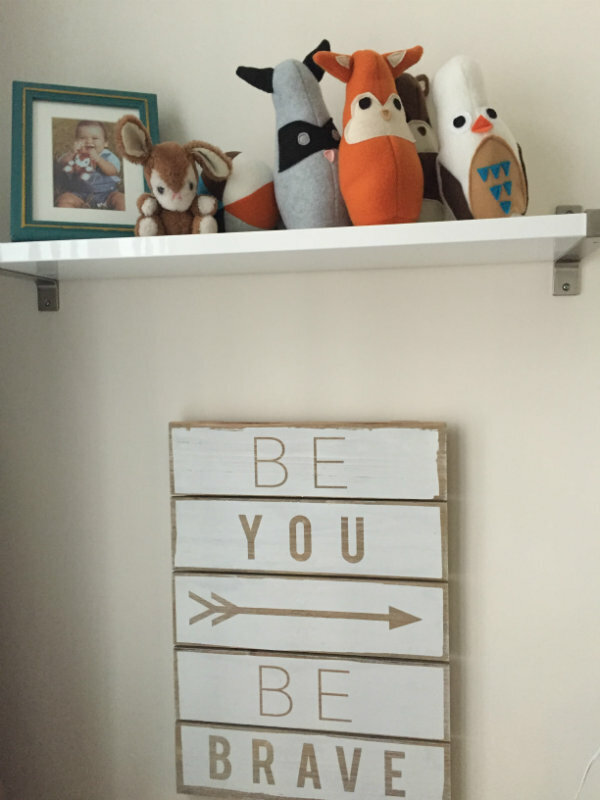 And who can resist an inspirational sign (also from Target)? Even though the room has built in closets, I needed additional storage, particularly drawers. 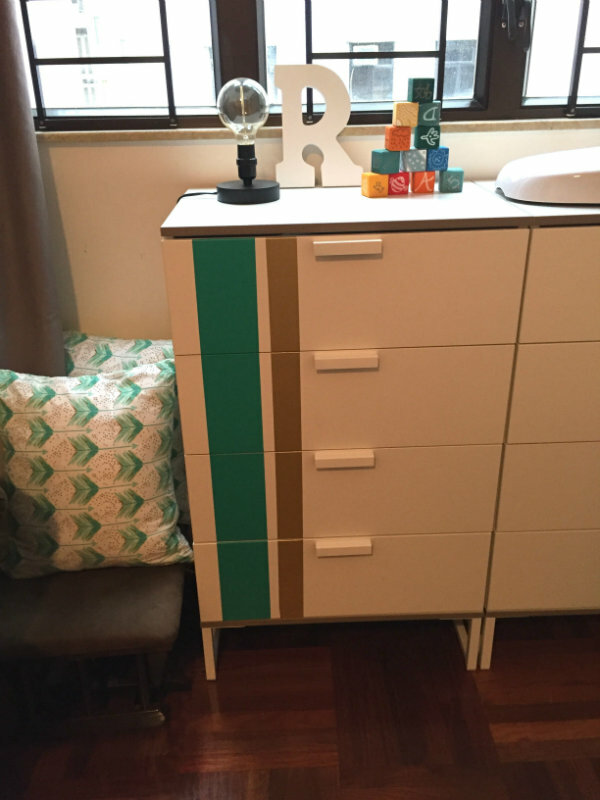 So we got IKEA dresssers (not our first choice– ah, the joys of living in a big city!) so I thought I’d customize them a bit with some washi tape. The blocks on top are from my baby shower with sweet messages from friends. 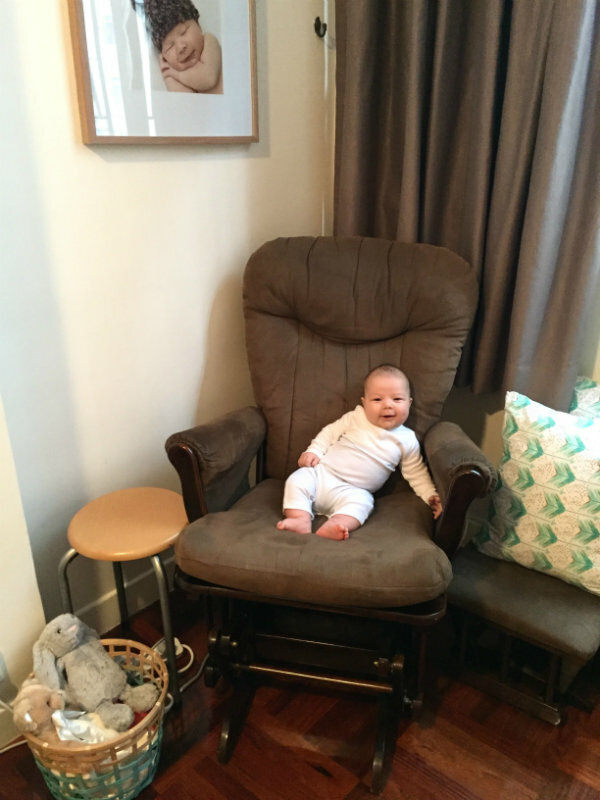 When we moved, my first purchase was a rocking chair for nursing. I used it a lot when I was pregnant due to being so uncomfortable, so we moved it to the living room. So now we have 2, one in each room. And who’s that sitting in the chair?! Right under a picture of himself, the cutie pie! (By the stuffed animal basket is a mat I use to lay him on for stretching and tummy time). And finally, here’s a pulled back picture of the room. I’m pretty happy with how it came together. What do you think?